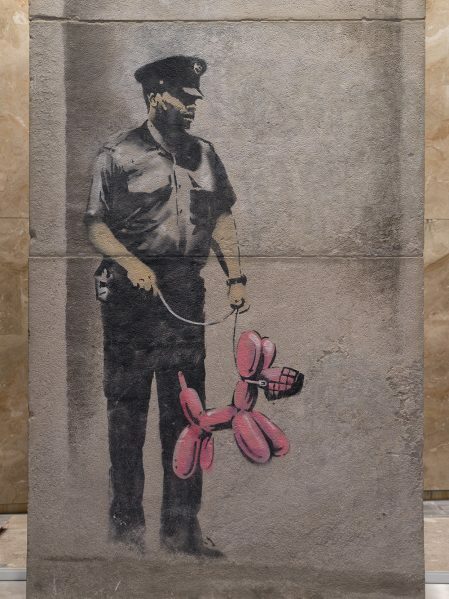 Menkes Developments Ltd., a Toronto-based real estate firm, has unveiled a public art installation in downtown Toronto, featuring a stencil attributed to the anonymous British artist Banksy, referred to as ‘Guard with Balloon Dog’. 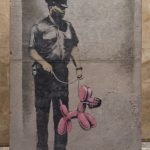 Designed in the stenciled approach to graffiti art associated with works by Banksy around the world, the piece was originally applied to the rear façade of the vacant building previously situated at 90 Harbour Street in May 2010, when Banksy visited Toronto following the release of his film, Exit Through the Gift Shop. 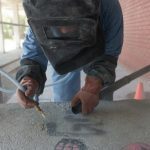 The same weekend in May, six other works attributed to the artist appeared throughout the city. In 2011, the 90 Harbour Street property was purchased by Menkes for redevelopment, and demolition of the building commenced. 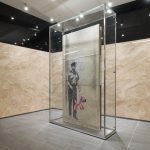 Aware of the Banksy work on the building’s façade, demolition crews were instructed to protect the panels of limestone on which the art was applied. 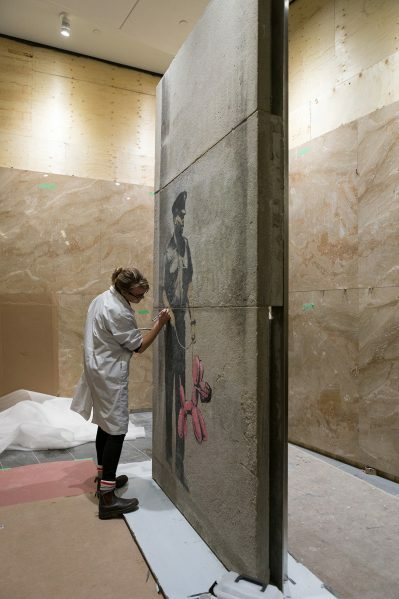 Subsequently, Menkes had the slabs removed, preserved and professionally restored in anticipation of finding a new home for the piece in the public realm. 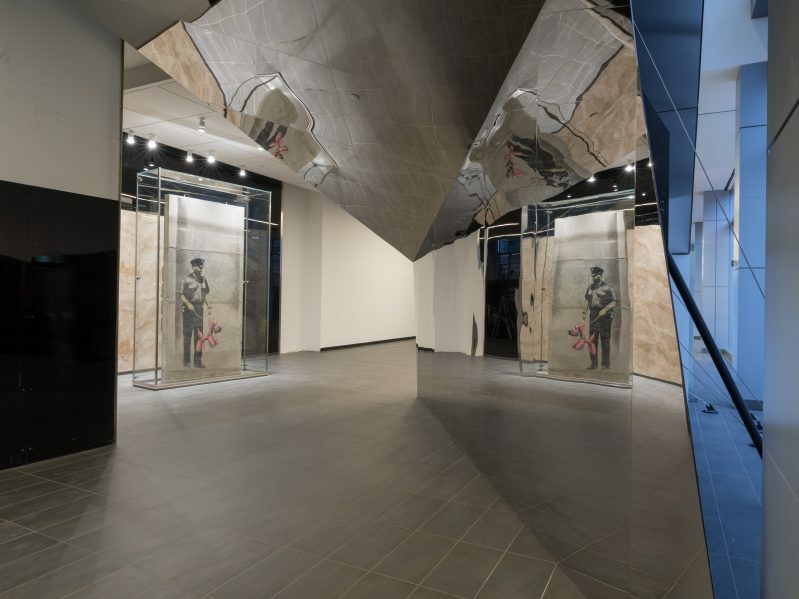 The 90 Harbour Street site was redeveloped into a mixed-use project, encompassing two million square feet of residential and commercial space. 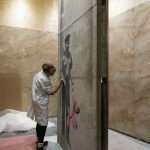 The project features two 66- and 70-storey condominium towers, known as Harbour Plaza and a 35-storey AAA commercial office building called One York, all situated on top of a four-storey retail podium directly connected to the PATH system. 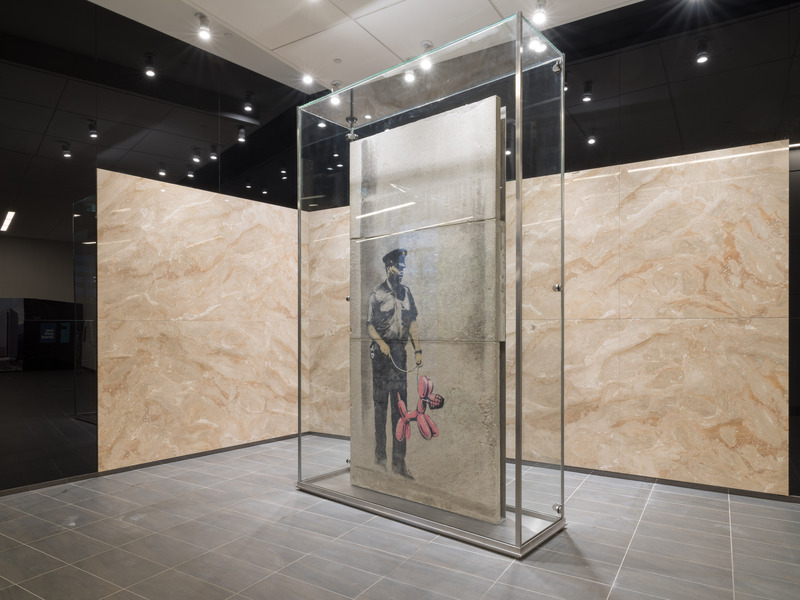 Menkes sought to place the Banksy piece in a public space and eventually selected a location in the PATH network adjoining One York. The PATH is downtown Toronto’s pedestrian walkway network that spans 30-kilometres, and features approximately 1,200 shops and services, as well as connections to all the major office towers in the financial core, major tourist and entertainment attractions, six subway stations and the Union Station railway terminal. 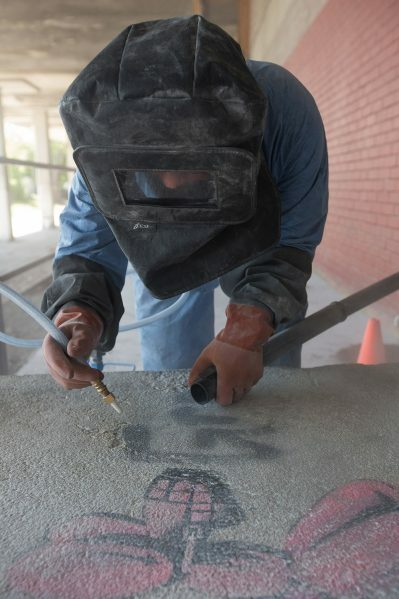 The network is primarily underground but south of Union Station it moves above grade. 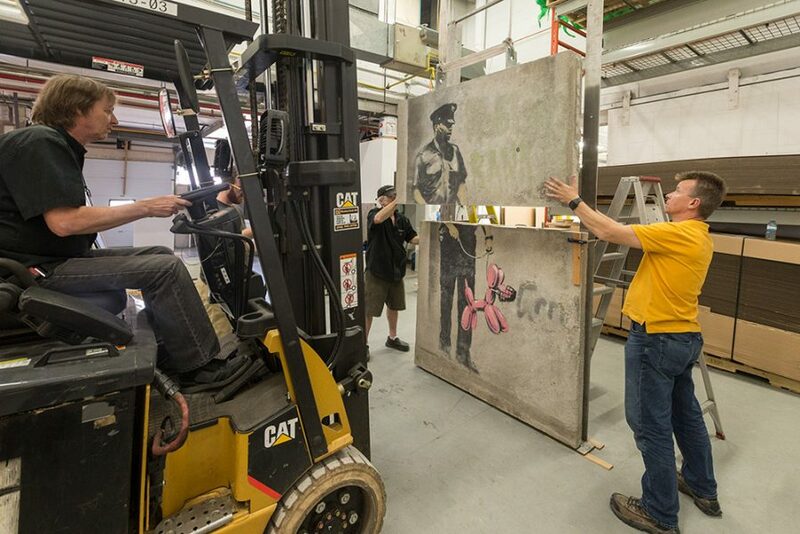 As it crosses One York, the PATH is on the second floor on the north side of the project and this is where the Banksy installation is situated. 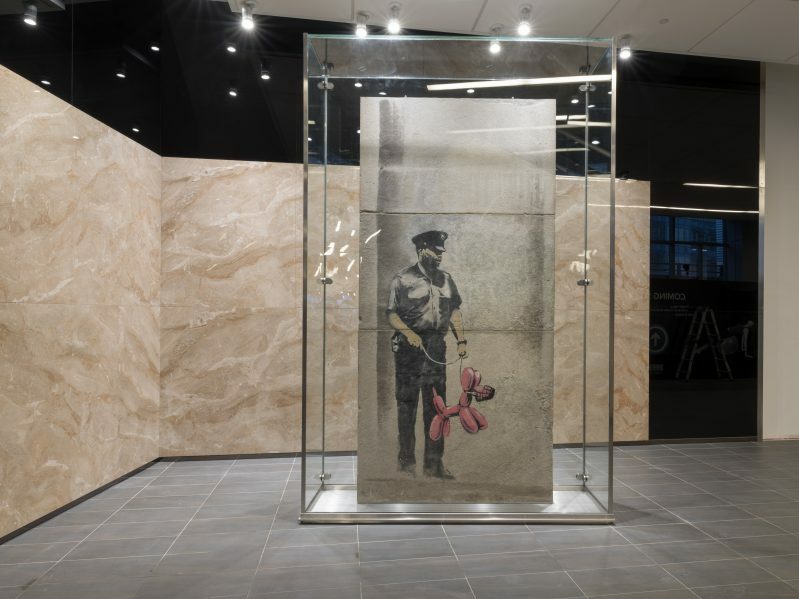 The restoration of the Banksy, its re-installation, and the fabrication and installation of Speculum, are all part of a $2,000,000 public art package included by Menkes in the Harbour Plaza / One York project. Construction of One York (a partnership of Menkes, HOOPP and Sun Life) commenced in January 2013 and the building opened in the Summer of 2016.